Good Morning Everyone! I have a quick post for you today - I'm still playing with my stamps. Actually, I decided that I needed to play with my new There She Goes Stamps even though I'm behind a couple of releases. I just couldn't get my lighting correct with card, no matter what I tried. The base is white, but the next color is Chocolate Chip and it still looks black to me. Anyway, I made this card for the TSG Monday challenge which is a 1, 2, 3 challenge: 1 decorative paper, 2 card stock colors and 3 embellishments. I also used a sweet and simple sketch from Unscripted Sketches. I created my own digi stamp for this card. I made the little platform train that the animals are in. It was really very easy to draw in a drawing program with some basic shapes. Then I masked it off so that I could stamp the little animals so it appears they are in the wagon-type platforms. I hope you like my card. Thanks for stopping by and I hope your Monday is good to you. 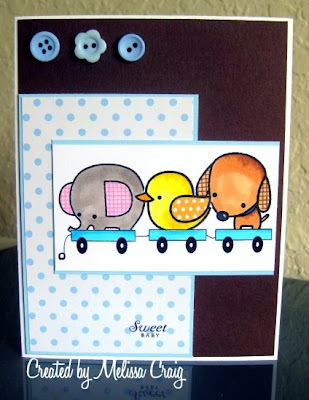 That is such an adorable image and LOVE how you made your card fit the Unscripted sketch. Super sweet and oh so adorable! What a precious baby card! Thanks for playing at Unscripted Sketches! Darling card, Mel!! Love the little animals and fun paper piecing!! I love the digital image! It's adorable!!! Thanks for playing along with Unscripted this week!